Whether you are needing films transferring for professional or domestic purposes we offer a service to suit using our Filmfabriek Muller HDS+ 4K film scanner. 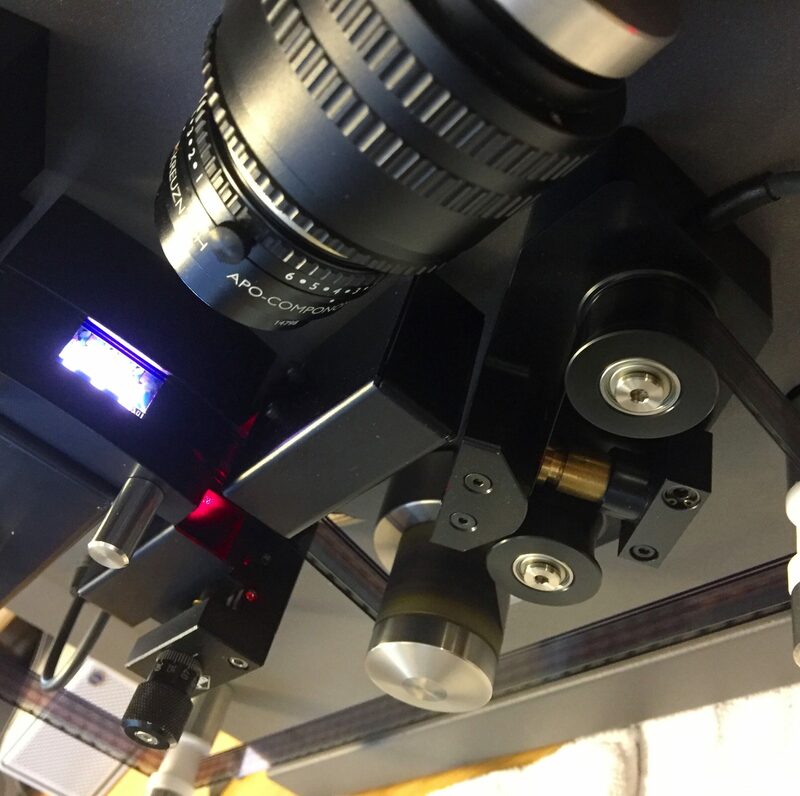 With variable tension, cool flash LED illumination and sprocktless drive our scanner is ideal for both the latest 16mm negative film or fragile vintage films that are decades old so whether your film is from the 1930’s or has just come back from the processors we have a service that you will love! We can scan with a wide dynamic range from 2K to larger than 4K resolutions and can overscan to include film edges beyond the 4K frame height and width as the sensors are larger than full height 1080 HD or 2160 UHD Also ideal for making full width output in HD without any picture zooming for best quality. The gate is suitable for 16mm twin perf and single perf with optical or magnetic sound and Super 16. For larger collections we offer a test scan if you are unsure how this stacks-up against some of our more expensive competitors, we think you will be pleasantly surprised by the exceptional scan quality we can achieve. Call us to discuss your requirements, we transfer for archives, film and tv productions, experimental film makers, the home movie enthusiats and more! Just because we are cost competitive does not mean we cut corners, all films are fully cleaned prior to scanning, films are wound onto clean spools and the scanner also has a set of PTR rollers to trap any remaining dust and dirt on the surface. Scans are produced frame by frame, typically 16, 18 or 24 frames per second (fps). Frame rates can be adjusted from 16 or 18 FPS to 25 as required for editing with tween frames added for correct speed and 24fps can be simply changed to 25fps to give best playback with minimal speed increase (how all motion pictures are broadcast in PAL). Our system also includes the amazing Filmfabriek wetgate system which is employed for badly damaged and scratched films, the wet gate helps reduce and remove the appearance of scratches and surface damage during the scanning process and is suitable for both positive and negative films and is highly recommended. Raw Scan or digitally cleaned up? Scanning in uncompressed files then allows us to then post process to remove dirt and blemishes present within the film, light de-grain, stabilise and sharpen, making the end result a high quality digital film. You can opt for a raw scan if you wish to do this yourself or have both ! From just 18p per foot!